Please note: My personal blog is now on blog.agoeldi.com. This blog here will not be updated anymore. For those of you who read German: I also blog frequently on the leading German tech blog, netzwertig.com. I currently do a lot of work in the field of web-based enterprise software, also called "Software as a Service" (SaaS). This sector that once was a tiny niche of the software industry is growing rapidly. Pioneers such as Salesforce.com have grown to become small giants, and the big players like Microsoft, SAP and Oracle are all entering the market. Even Google is very active with Google Apps. Web-based applications are increasingly becoming an important part of the Internet ecosystem. While observing this market, I often asked myself if there are any historical parallels to this wave of innovation. Sure, history doesn't repeat itself, but often there are comparable development paths. 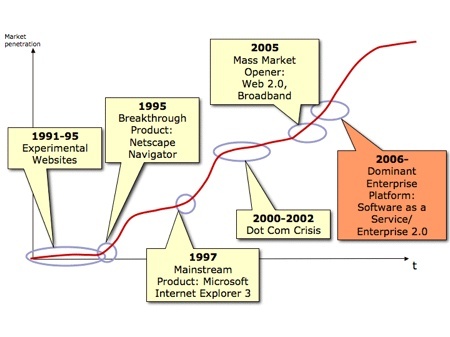 In innovation research, it's a well-known fact that there are observable patterns: disruptive technologies, adoption curves, the emergence of dominant designs etc. Although these patterns don't help to precisely predict the development of a given market, they still provide some useful insights about possible future directions. The big wave of innovation in IT before the Internet arrived was of course the rise of the personal computer, starting in 1974. Therefore, I have tried to draw a diagram of the most important phases and key events of this older wave. The "market penetration" axis is purely qualitative and only for illustration purposes. After a purely experimental phase in the late seventies, the PC experienced a first breakthrough with the Apple II and the first killer application, the VisiCalc spreadsheet. In 1981, IBM brought its PC to the market, and that was the first product that appealed to mainstream corporate IT buyers. After a crisis in the mid-eighties, Microsoft released Windows 3.x which turned out to be the generation of software that really opened personal computing to the mass market. In figures: In 1990, there were 100 million PCs in use worldwide, today it's over a billion. For 2015, some experts predict over 2 billion PCs. 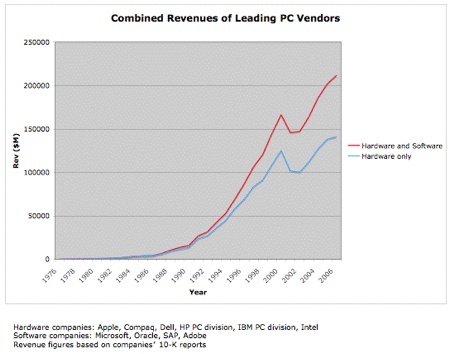 The upper curve shows revenues of the largest PC-related companies (both hardware and software), while the lower curve shows only hardware firms. Quite obviously, the software industry was a neglectable quantity for many years until it started to grow very rapidly in the early nineties. And we're talking here about today's behemoths Microsoft, Oracle, SAP and Adobe. Only after the introduction of Windows 3.x and client/server these companies started to grow to the level of importance (and, one might add, enormous profits) that they enjoy today. After the experiments of the early nineties, the first breakthrough came in 1995 with Netscape Navigator, the first software that made the web accessible to everybody. When Microsoft, the dominant software vendor, released its first usable browser in 1997, the web really became mainstream. After the dot com crisis, the increasing availability of broadband access and web 2.0 applications finally opened the mass market, as measured by usage time and user involvement. Before broadband, there that was mostly e-mail and some online shopping, after broadband there was MySpace, blogging, online music, Youtube and so on. The question now is of course if Software as a Service and the closely related "Enterprise 2.0" wave will really turn out to be the dominant new platform for enterprise applications. There are many things in favor of this theory: web-based software is typically much more cost-efficient and flexible, in the same way as the PC was much more cost-efficient than the good old IBM mainframe. SaaS applications are currently used mainly by smaller companies and departments of large corporations, but not yet enterprise-wide at large companies. Client/server applications went through a similar adoption path. Sure, not all things in the SaaS world are perfect. Web-based applications are still experiencing a lot of growing pains, and the technology can sometimes seem quite immature. But the same was true in the PC era. Most peoply can hardly remember how much work it was just to keep your Windows 3.1 system running every day. But this unruly technology still became dominant. It's possible that we are currently experiencing a historical turn in the history of the software industry. More and more software will be available on the Internet for immediate access. The web is becoming more than a medium for information access, publication and participation, it is also turning into the dominant application platform. The fact that Microsoft is now openly trying to fight Salesforce.com is a clear sign for this change. Who will be the winners of this new wave? That's very difficult to predict. But there's one thing we can learn from the history of technology: The winners of the previous revolution very rarely also dominate the next generation of technology. I've been invited by my friend Bruno Giussani to guest-blog on his excellent blog Lunch over IP. Bruno is a writer for several major international publications, a conference organizer (TED Europe) and a book author. As Robert Scoble put it, he is "the guy you wish you knew in college." The IT industry has a new favorite buzzword: Consumerization. According to this concept, more and more innovation in the IT sector is driven by the consumer market, not by enterprise customers. It's not something that just a few entrepreneurs and VCs have made up. Even the analysts at Gartner -- the high priests of enterprise IT -- acknowledge the trend and encourage CIOs to experiment with consumer IT products. The shift to hardware and software originating in the consumer space, Gartner says, can't be stopped anyway. And many VCs now ignore the enterprise sector outright and invest only in consumer plays. So who are these consumer, anyway? Like most buzzwords, consumerization of IT is quite an oversimplification as a concept. It suggests that there is a completely separate world of non-professional IT users that have completely separate needs. As we all know, that's not the case. Most consumers are people who use IT every day at work. They have come to expect a high level of reliability and functionality from IT products, and that doesn't change as soon as they go home after work. But at the same time, they expect the stuff that they use at home to be more fun, easier to set up and simpler to use. Is it surprising that this in turn influences the expectations that they have about enterprise IT? What's more, many trends in the so-called consumer space are actually driven by people who use IT for professional purposes, but outside of traditional enterprise structures: freelancers, writers, creative professionals, startup employees. For instance, many of the supposedly consumer-oriented Web 2.0 software products and hardware accessories are actually used by this type of user. They don't have access to cheap IT support and don't want to spend a lot of money, so simplicity is key. So, maybe the consumer space really should be defined as "people using IT in the absence of an IT department". What was a home computer good for 15 years ago? Not much, maybe a bit of word-processing and some bookkeeping, a bit of education and some simple games. The most adventurous users would maybe connect a modem and dial in to some bulletin board systems. How times have changed. The home PC now is a communications center (when was it that everybody started to use e-mail? ), the gateway to the world and its information. It's rapidly becoming the main source for media content and news. It's the thing that we use to organize our pictures and our music, edit our home movies and express ourselves creatively in many other ways. And it's a fantastic game console. Typical home computers used to be at the lowest end of the PC market, just barely powerful enough to handle some basic computing tasks. Now go to Dell's web site and look at the gaming machines. They are far more powerful than all but the most expensive corporate server machines. And all this power actually makes sense for games and digital media applications. That's one main reason for customerization: The corporate desktop PC simply has run out of applications that need more power. How much more speed do you need to write some Word documents or run the ERP client software? Not so in the digital home: Every increase in CPU and graphics speed is very noticeable for today's home computer applications, so home computers drive innovation. Corporate IT departments are not the best advocates of simplicity. And why should they be? After all, if IT people want to keep their jobs, it doesn't hurt that users need a lot of support and that there are glitches to repair. Management asks for progress and efficient processes, so IT rolls out more and more features on ever more expensive infrastructure. And IT vendors are of course happy to help. Who cares that users don't want and need all this complexity and will never use this expensive stuff? But it doesn't work like that in the consumer market, where people spend their own money and their own time on technology. I recently bought a Mac Mini, maybe the prototypical consumer computer in today's market. I was shocked. It just worked. It didn't waste my time with endless installation routines, virus checks and driver downloads. When I connected my printer, it did nothing. Or to be exact, it just installed it in the background, without bothering me. Again, it just worked. Not like my PC (that runs the operating system with a "Professional" in its name) where the same process would have cost me at least ten minutes. The same experience is typical for many of the best Web 2.0 applications. They give you good functionality without the overhead of traditional desktop applications. They are instantly available and do not require any training. Of course, they are by no means perfect. But they're simple, easy to use, and cheap or free. They're an elegant solution to a well-defined problem and not more than that. But also not less. What's in it for everybody? Antoine de Saint-Exupéry once said: „Technology always develops from the primitive via the complicated to the simple." Few people would disagree that traditional enterprise IT is complicated. And expensive. And unnecessarily complex. Sure, it tries to solve complex problems. But is that always the most effective thing to do? Maybe it would be more rational to first solve the simpler problems in a more cost-effective and user-friendly way. Of course, IT professionals are perfectionists. But they tend to optimize the wrong dimensions. Consumers behave differently, because they are willing to forgo functional perfection in exchange for simplicity and cost-effectiveness. Could consumerization be the big step to a new era of simple, elegant IT? That's absolutely possible. It's not surprising that this trend is driven by consumers that are savvy (because they are at the same time experienced professional users of IT) but are also not willing to put up with high costs and complexity in their private lives. Who will be the winners? Well, consumers, obviously, and the companies that build the best products for them. But achieving real simplicity is very hard, and there are some very complex things behind every simple user interface. Just look at Google's infrastructure or Apple's iPod business model. Those that can handle this complexity and hide it behind a pretty facade will be the biggest winners, both in the open market and in the world of enterprise IT. Today, the Web 2.0 Summit conference in San Francisco started. Everybody is there, absolutely everybody. Well, I'm not, I'm just reading all the blogs, but apparently everybody that really matters is there. So many things look strangely familiar, like it's 1999 all over again. I almost feel a little bit nostalgic. 1/3 are companies that you would actually expect to sponsor such a conference, because they are really important players in this market. Like Yahoo, Microsoft, or Google. In non-bubble times, this type of company would be 100% of the sponsor list. But not now. 1/3 are conservative companies that would love to be part of the new revolution. Like IBM, Accenture, Nokia, and the New York Times (in the form of their About subsidiary). It's good to remind people that you're still there. And 1/3 are companies that you've never heard of. Obviously they're burning their venture capital here (At least that's a more reasonable way to do that than the huge launch parties back in the old days). Some of their logos look like they came out of some generic Web 2.0 logo generator with settings on "default". Well, visibility is everything in a bubble. Especially when your company is really only a feature that Yahoo already has. Once again, Google is making a lot of headlines. The YouTube acquisition with its eye-popping valuation gets most of the press, but in my opinion, the introduction (on the next day) of Google's new "Docs & Spreadsheets" application suite could be more significant in the long term. A code analysis (thanks, Markus) even hints at the possibility of a future offline version that would run locally on a PC. In the context of the nascent Office 2.0 wave, that's a major thing, although the product itself is by far not the best in its class. It's not surprising that people become increasingly critical about Google's dominance. Many already compare it Microsoft, who up until now had a firm grip on the title of "most-hated IT company on the planet". Ignore the incumbent technology and lower layers of the stack, and focus on disruptive innovation in a new technology family. Microsoft ignored the mainframe and commodity PC hardware and fully concentrated on PC software. Google is ignoring the local client machine. They're fine with every OS and browser, as long as you use it to access their services.That's why I don't think there will (and should) ever be a Google PC or Google OS. Invite everyone to join in and make money from using your platform. Microsoft had its cheap developer tools and free SDK, Google has Adwords and open APIs. Of course, both companies keep tight control over the core. Both are "open, but not open" platforms. Build a whole range of "good enough" products around your core product. It doesn't matter if they're not best in class, as long as you can leverage the connections to your platform. Microsoft did this with Office and SQL Server, Google does it with Docs&Spreadsheet, Calendar, Reader, Froogle etc. "Good enough" is adequate to defend your position. Build strong distribution partnerships. Microsoft has OEMs and a huge ecosystem of partner companies. Google has Dell, Intuit and already quite a lot of enterprise partners. 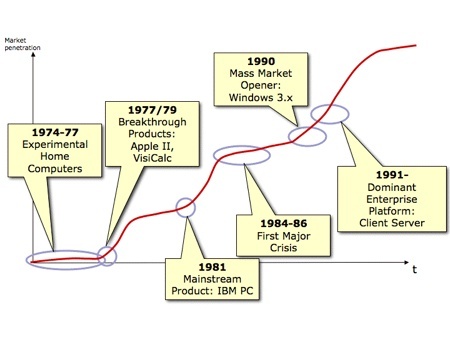 Unfortunately for Microsoft, it finds itself in almost the same position as IBM 25 years ago. It's stuck with a heavy legacy that makes it difficult to fight off the disruptor. Sure, Microsoft will probably keep its dominance in many sectors, much like IBM is still the dominating mainframe computer manufacturer. The question is only if this will still be relevant in ten years. The New York Times has a report about three start-up companies that try to sell services on top of online classifieds platforms such as Craigslist. The three companies, vFlyer, Postlets and Mpire, basically try to help advertisers to design, position and publish their ads in an efficient way. Positioning of ads in an effective way, optimized for the target group. Not every ad works best on Craigslist. Reduction of transaction costs for everybody involved, especially for advertisers. This includes ad production, automated posting, response tracking, ad management, analytics etc. VFlyer, Postlets and Mpire are offering exactly this type of service. However, they are currently focusing on the ad-production and automated publishing aspect, which in my opinion is too narrow and easy to imitate. It gets much more interesting as soon as you are able to cover an advertiser's whole value chain. According to the NYT article, Postlets' founders were surprised that their service is used mainly by professionals such as real estate agents or car dealers. Frankly, I think it's quite obvious why business users like this kind of service. Professional advertisers have the highest transaction costs from putting ads on various platforms, so they respond well to any kind of help with this problem. I think there's still a great market opportunity in the market for online classified services. But it's a proposition that is interesting mainly for business users, not so much for consumers. And you need to go beyond just publishing ads to higher-level services that can't be imitated so easily. And by the way: Newspapers are still important in many markets, so thinking cross-media doesn't hurt. The Digital Music Market: Back to Closed Systems? The current developments in the market for MP3 players and digital music downloads are puzzling for many experts: imitating the success of Apple's iPod and iTunes combination, Microsoft is preparing the release of its own proprietary system in the form of the new Zune player and music store. Microsoft will continue to support its semi-open PlaysForSure platform that many independent hardware vendors use, but it's clear that most of the investments will go to the closed Zune world. And now, even RealNetworks's Rhapsody music service announced a Rhapsody-branded music player in cooperation with SanDisk. Apparently, this new player will use a proprietary Rhapsody software for DRM. Some time ago already, Napster did the same. In theory, it wasn't supposed to work this way. Apple's music player strategy was often dismissed as being the typical Steve Jobs way: Build a great, but proprietary product and then get left behind while the world moves to open standards. It was like that with the Mac, and it will be like that with the iPod, the experts predicted (Nicholas Carr has a detailed post about this). At least for now, just the opposite is happening: All the big vendors are busy building their own "walled gardens", duplicating the efforts of developing player hardware, rolling out software and licensing music. Isn't that terribly inefficient? Innovation theory says that a maturing technology should move towards an open architecture with clean, well-documented interfaces that allow everybody to compete on making the best components and end-user products. The typical results (as demonstrated by the PC market) are fierce competition, falling prices and in some cases a few companies that make huge profits because they control key elements of the standard. But what do we see in the digital music market? A confusing mess of competing DRM standards, one strongly dominating player, and a number of competitors that try to push their own closed systems. Not exactly a market right out of the textbook. 1) The music industry simply isn't interested in promoting (or even allowing) a more open world of music selling. They still regret the "mistake" of letting Apple license so much music and thereby establishing the standard price point of $0.99 per track, which is much too low in the opinion of music executives. Opening the model even more would probably drive down prices further. Of course it would also dramatically enhance demand, but thinking long-term doesn't seem to be a requirement for getting an executive job in the music industry. 2) There actually is an open standard, and it's called MP3. Consumers listen to their ripped (or illegaly downloaded) MP3s and don't really care that much about the various commercial music download offerings. According to a new study by Jupiter Research, the average iPod contains only 20 titles bought in the iTunes music store. That's not even a $20 value. Only 17% of iPod users buy digital music regularly. In other words: Consumers aren't stupid. They won't let Apple (or anybody else) lock them in too much with copy-protected tracks. As long as there is no open DRM standard that allows owning songs forever and playing them on any device, online music sales will continue to grow much slower than they could. But this also means that Apple is not as invincible as many think. If Jupiter's figures are really correct, the iPod's success is not based on the brilliant integration of a device with a proprietary content store, but simply on the fact that iPods are still the coolest MP3 players. And Microsoft's Zune isn't, for now at least. Google seems to be very serious about capturing the small business market. Only a few weeks ago, they introduced the somewhat clumsily named "Google Apps for Your Domain", a package of Google's web-based productivity apps for businesses. Today, the search king (or emperor?) announced a major partnership with software maker Intuit. Intuit's most popular product QuickBook has a share of -- depending on the source -- 75-85% in the market for small business accounting software. In other words: it's for accounting what Microsoft Word is for word processing. And now Google's services will be fully integrated with this dominating product. QuickBook users will be able to list their business in Google Maps, create AdWords campaigns and search their hard disk using a QuickBook-branded version of Google Desktop. Even more interestingly, they will be able to publish their product lists on Google Base, Google's still not terribly successful classifieds platform. Companies that don't have a web page yet (yes, there is such a thing) will get one from Google for free. And obviously, there will be a lot of cross-selling potential for Google's other nice products. However, I wonder what Google's international strategy will be to reach small businesses outside of the U.S. In most countries, there's no such clearly dominant player as QuickBooks, and the most important products are different in almost every country. Many people had expected great announcements from Apple's "It's Showtime" event yesterday, but what Steve Jobs finally presented was underwhelming: Some nice incremental improvements on the current iPod models, a pre-announcement of a PC-to-TV box, and movie downloads. The last part was the most disappointing. Apple will offer only Disney movies (for obvious reasons) for download on iTunes at a price point of $9.99 to $12.99 apiece. They will come in not-quite-DVD resolution and be available on the first day when they're also available on DVD. Isn't that great? Now you can download "Pirates of the Carribean" for the same price as the DVD in slightly inferior quality and can't even watch it on your TV without problems. What was the value proposition again? This is frankly even worse that Amazon's Unbox offering that was announced only a few days ago. Somehow the movie studios seem to be paralyzed by wanting to avoid the same mistakes that the music industry made. But the result certainly won't appeal to consumers. Others try alternative models: Sprint recently made an interesting announcement. They will offer full-length movies on their multimedia phones for between $3.99 and $5.99. Judging from the initial title lists that contains such masterworks as "American Pie" or "The Nutty Professor", Sprint wants to market this service mainly to families that need something to keep the kids busy in the backseat. That's an interesting marketing idea, but I'm not so sure how successful this will be when junior's streaming video connection keeps breaking down all the time. Unless network coverage improves dramatically, a portable DVD player still might be the better choice for the family car. At least there's currently a lot of activity in the online movie market, so there's still some hope that over time a decent business model will evolve. But apparently it won't come from Apple this time. To much fanfare, Amazon.com this week unveiled their new movie download service, Amazon Unbox. The speculations had been running wild before this announcements, and some bloggers even praised Amazon as "the new Google". Now, after seeing the final product that Amazon just released, everybody is simply quite disappointed. Reviews range from the mildly positive to the downright slating. Amazon based Unbox on Microsoft's DRM technology, the same stuff that many smaller music download stores and early movie-download services such as CinemaNow use. This means that users have to download a special player that works only on Windows XP. Handling your content licenses in this technology is quite cubersome. Very often -- I'm speaking from my own experience -- you'll find yourself unable to play a movie because the DRM somehow decided that your license for this piece of content has expired. The software frequently accesses the Internet, so playing movies offline (like, for instance, on a plane) is often not possible at all. And copying your content to a mobile device (only Windows-media compatible of course, no iPods please) is equally difficult. In other words: It's unusable for normal people. Hmm. Amazon Unbox obviously has the advantage of a comparatively broad selection (although it's currently nowwhere near real "Long Tail" economics). On the other hand, it's the most expensive and has the highest hassle factor. OK, if you download a movie from Unbox, you theoretically "own" it, but considering the limitations and DRM hassle, no self-respecting cinephile would see this as a replacement for a DVD collection. Sorry, but this value proposition is simply not good enough. Music downloads work because you get what you want (a specific song) for very little money ($0.99 instead of $15 for the whole CD album with useless filler songs) very quickly (a few seconds of download time). The disadvantages of Amazon Unbox mean that it probably will work as a second-best replacement where the other methods aren't available, but in this form I'd be surprised if it would turn out to be a success. So let's see what Apple will announce next week. Book Review: "The Change Function"
Here's a short review of the just published book "The Change Function" by Pip Coburn. The author was the managing director of the technology group at UBS Investment Research and now owns his own research firm. The book's basic message is that the technology industry is so fascinated by technological possibilities that it completely neglects (to its own disadvantage) what users actually want. The bust of the Internet and telecom bubbles and the still lasting crisis of the technology industry was caused by this ignorance, claims Coburn, and he uses a number of case studies to illustrate his ideas. The heroes of the techno-elite are Intel founders Gordon Moore and Andy Grove with their respective laws about the exponential development of technology. "Build it, and they will come" is the motto of most technology firm. But very often they don't come, because customers are less and less impressed by pure technology alone. The really important question is, according to Coburn, what "crisis" (in the form of a problem or desire) customers have and how big the perceived pain of adoption is. The resulting change function, "f(user crisis vs. total perceived pain of adoption)", is not really a precise formula, but rather a way of expressing that customers compare these two factors when they decide whether to buy a new product or not. The most successful products are of course those that solve a big customer problem, but are easy to adopt. And when measuring the cost of adoption, the product's actual price tag is not really that important. The pain of learning how to use the product and the necessary changes in behavior are much more relevant. Coburn lists a lot of technological flops that ignored this simple rule: the picture phone, interactive TV, the Tablet PC, B2B markets. He even makes some predictions about the odds for success of some currently "hot" technologies: HDTV, mobile e-mail for everybody and satellite radio will turn out to be a success, while RFID will fail or at least take a very long time to get broad acceptance. The book is not as scientific as you might think from reading its mathematically sounding title. On the contrary: its style is quite casual and at some points maybe overly rich in anecdotes, but fortunately, the author doesn't use the usual business book lingo. Most of the case study subjects are actually well known, but there are also some real gems, for instance the very detailed analysis of software-as-service vendor Salesforce.com. The book's basic idea is really not new: Find out what your customers want, analyze what possible reasons they might have not to buy your product, and then create a product that addresses these concerns. A truly simple message, but Coburn is certainly right about the fact that the technology industry frequently ignores this rule. Most customers are not fascinated by technology, they simply want to solve a problem, preferrably without technology. That's also something that many Web 2.0 startup companies should consider. Too many of them still believe that it's a great success to sign up the usual crowd of 50'000 geeks that participate in every beta program anyway. But the real end user doesn't really care about the elegance of social microformat tagging with an AJAX interface. They simply want to get the job done. "The Change Function" is a very accessible, fact-rich book about the possible failures when companies try to innovate. There are also a few brief thoughts about the importance of organization and corporate culture, and finally the author gives extensive advice about how to select a successful management team for a technology company. The book is certainly by no means as extensive and rich as for instance Clayton Christensen's work about technological innovation, but it is a good primer about the subject. By the way: Pip Coburn's short text on ChangeThis is a good summary of his ideas. Tablet PC: Time for a Reboot? For many years, the PC industry has been trying to push pen-based computers into the market. 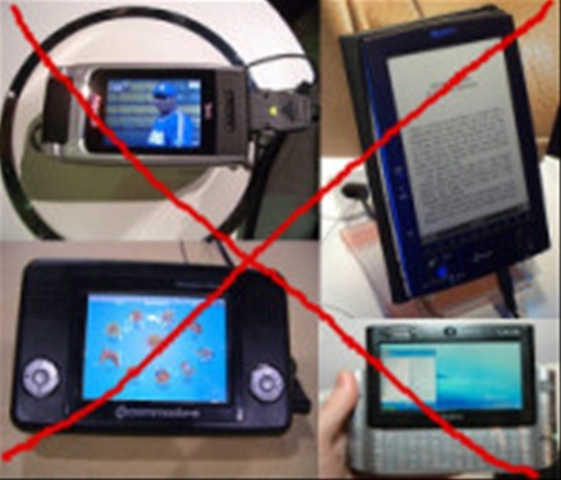 Most devices have failed dramatically. But still, the idea seems to be fascinating to many. Maybe it's all about trying to replace the "unnatural" established way of operating a PC with a keyboard and mouse by something more "human". The current generation of pen-based computers is of course the Tablet PC. The Tablet Edition of Windows XP was released by Microsoft almost four years ago, and by most standards, it can't be described as a huge success. Most Tablet PCs are sold to niche markets such as healthcare and insurance salespeole, not to mainstream laptop users. And the newest attempt to change the Tablet PC into a more consumer-friendly device in the form of the Ultra-mobile PC (UMPC) is simply a downright failure. Microsoft recently quitely renamed the Tablet PC group. The team is now called -- in typical elegant Microsoft fashion -- "Mobile and Tailored PC Division". Maybe that's a sign that Microsoft is abandoning the original Tablet PC vision. And that's probably a good thing. GottaBeMobile.com recently had an interesting post about how normal people use Tablet PCs in their everyday work and live. The result: Almost nobody ever uses all the wonderful "Ink" functionalities, because people simply don't understand what to do with them. For most users, the electronic pen is simply an alternative navigational device. Text is still written on a keyboard, not by hand. I have been a Tablet PC user for many years myself (currently a happy owner of a Motion Computing LE1600), and I completely agree with these findings. I practically never use my tablet's handwriting recognition capabilities, because even with a 95% accuracy, it's almost unusable in practice. Many of the tablet usage scenarios that you read about in brochures (annotating documents, hand-written e-mails etc.) are not really practical. A Tablet PC is ideal to take some notes in a meeting, since then you don't have a "wall" in the form of a laptop screen between you and the other participants. But this feature alone is probably not worth the additional cost of a Tablet PC to most people. What's wrong with this technology? I'm convinced that the devil is in the details. Very often, it's just minor changes in usability that make or break a product. Touch screen and active digitzer: Tablet PCs typically have a so-called active digitizer, which means that they can only be operated with a special electromagnetic pen. UMPCs on the other hand have a touch screen that can be used with your finger but which is almost unusable for handwriting recognition. Why aren't both options available in the same device? The active digitizer "knows" after all when I'm using the special pen and could simply disable the touch screen. More pragmatic note-taking software: Microsoft OneNote is probably the most frequently used software for note-taking on Tablet PCs. Like so many Microsoft applications, this program offers many wonderful, but almost unusable features that distract from the actual task. OneNote tries to do almost everything with handwritten text that can be done with typed text, but that's both unnecessary and confusing. A simpler, unintrusive way to take and organize hand-written notes would be much more useful than complex collaboration functionalities. Better correction features: 95% accuracy for handwriting recognition means: Every twentieth word is wrong. That wouldn't be so terrible -- I probably make more mistakes than that when typing -- if only the correction features would be more elegant. Why can't I just write over the incorrectly recognized word and instead have to click several times simply to correct one single letter? Longer battery life: This is obviously desirable for every kind of portable device, but it's especially important for a Tablet PC. What happens if you take notes in a meeting and suddenly your battery dies? That's more than annoying, it's simply a reason not to use a Tablet PC at all. I'm using a extended battery for my Motion LE1600 that gives me 6-8 hours of constant operation, and that's about the minimum to make a Tablet PC really useful. Better keyboard options: There are two types of Tablet PCs: The keyboard-less "slates" and the "convertibles" that have a built-in keyboard. Both options are far from ideal. Convertibles are often big and heavy, and for most slates, there are no really good keyboard options. I think the industry needs to do some work on this form factor aspect. Why, for instance, isn't there a simple fold-out stand in the back of my slate? This would cost next to nothing, but make the device more useful. As I have mentioned, these are just some of the simpler things. One of the really big things is the fact that today's Windows GUI is optimzied to be used with a mouse and a keyboard. The digital pen is clearly still an afterthought, even in Windows Vista. This all somehow feels like the old text-based DOS applications that were able to use a mouse. But the mouse was only used to select menu options, and it took a completely new approach to user interfaces (the GUI) to make the mouse actually useful. And in much the same way, I think that the Tablet PC needs a new approach for a user interface that is really optimized for this new way of using a computer. Mobile Media Usage: What Happened to the Digital Revolution? Currently I take the Boston subway (the T) every morning during rush hour to get to MIT. Over the last few weeks, I counted how many people use which type of media on their daily commute. Obviously, these observations are by no means statistically representative, but still interesting. 10 people read a book. 7 people listen to their iPod, and most of them read something at the same time. Other types of MP3 players are rare, and very infrequently you see somebody with a -- gasp -- portable CD player. 2 people type on their BlackBerry. 5 people consume no media at all, not counting the ad displays they're staring at. Apparently, the free commuter newspaper has a marketshare (including iPod multitaskers) of over 70%. In contrast, the situation for traditional newspapers looks somewhat sad. Maybe people read a "real" newspaper at home, but considering the average age of commuters (about 35) I suspect that traditional newspapers have lost this customer segment. So far, digital media are only present in the form of iPods and a few BlackBerries. Good old print media still dominate the scene. I just wonder who is actually using all the great convergent gadgets that the electronics industry tries to sell. I can't think of a much better place for this type of gadget than a subway ride, and Boston really isn't a city of luddites, as far as I know. Convergence overload: The latest mobile devices are able to do simply everything. And that's too much. Obviously, devices with a clear focus (iPod, BlackBerry) are much more successful. Device babysitting: I personally would like to have a mobile blog-reading device that automatically pulls down my favorite feeds every morning. The content simply should be there whenever I want to access it, without the need for any activity on my part and without waiting times. We're far away from this. In most cases, content synchronization is a major pain that only works with frequent user interventions. Again, Apple has demonstrated how to do this in the right (i.e. simple) way. Format and DRM chaos: The songs that I bought on iTunes don't play on my Nokia mobile phone. "Blink" is available as an e-book only on MobiPocket, "The World is Flat" only on Adobe Reader. The industry apparently expects me to install three or four competing e-book systems on my various devices, and even then I can't use all content on every device. Lack of reliablity: Bad battery life and unstable software are still a problem. The e-book software on my PDA frequently forgets what book I was just reading and where I was in that book. I really wonder if this vendor's emplyees ever use their own product. The (mobile) digital revolution is still at its very beginning, and it's not moving very fast. And that's mainly the vendors' fault. I think consumers are open for many things, but not willing to put up with all these annoying imperfections. When I was looking at a long list of new Web 2.0 startup companies yesterday, I couldn't help but think about a book that I got a few years ago: "101 (Un)useless Japanese Inventions". 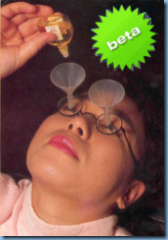 This wonderful little volume shows such great ideas as the full body umbrella, butter in the form of a roll-on stick, the subway snoozer's chin stand or eye drop funnel glasses. All these nice products solve a real customer problem. But they do it in a way that is not really that useful: Most of the time, you have to carry a special device that is often large, difficult to use or simply quite ridiculous. The pain from actually using these inventions is so big that most people would prefer to live with the problem the invention is trying to solve. Some Web 2.0 ideas remind me of these Japanese inventions: There are social network aggregators, OPML sharing services, specialized vertical search engines for every subject under the sun and mobile services for semi-anonymous dating. Sure, all these services solve real problems that somebody, somewhere might have. But there are two big difficulties: First, the effort needed to learn how to use and configure these services is big, especially in relation to the often limited usefulness. Second, most of these services only work really well when a lot of people use them (the famous network effect at work...), and in most cases it will be really difficult to reach critical mass. Maybe some of these entrepreneurs should read Pip Coburn's book "The Change Function". It's great that it has become so easy and cheap to found your own web-based company in this era of affordable Web 2.0 technology. But sometimes I ask myself if it hasn't become too easy. I think John Battelle is right when he says that startups simply don't fail fast enough anymore. Bad ideas happen, but it would probably be better for everybody involved if the companies that try to implement these ideas went out of business quickly. There are still enough good ideas that deserve the investment of talent and money now going to so many simply bad ideas. Well, yes. But don't worry, I won't bother you with boring details about my uninteresting personal life or stories about what my dog did today (which is easy, since I don't have a dog...). No, I will write here about digital convergence. I have been fascinated by media in all its forms for all my life, and not less so by information technology and telecommunications. Seeing all this coming together now in this current major trend of digital convergence is very exciting to me, so I can’t stop writing about my thoughts and ideas about this topic. I have been writing a (quite successful) German-language blog called “Beobachtungen zur Medienkonvergenz” for about 18 months now, and now I’m trying to switch to English with this new blog. One reason for this is the fact that I currently live in the United States, and the other reason is the much bigger audience with its much greater potential for interesting conversations. A word about my background: I’m currently taking a sabbatical and attending the Sloan Fellows Program in Innovation and Global Leadership at MIT. This is a very intense study program with a fascinating group of people. I’m doing this to gain some new perspectives after a dozen years in the Internet/e-commerce services industry. In 1996, I co-founded a company called namics ag, which today is the leading e-business consultancy in Switzerland and also has three offices in Germany. We currently have around 160 professionals and work for clients such as Nestlé, Siemens, or the European Central Bank. I don’t have an operational role anymore, but I’m still a board member and shareholder. Furthermore, I’m an investor in a startup called Blogwerk AG that intends to build a blog network for German-speaking Europe. In this blog, I will write about all kinds of events, ideas, concepts, devices and scandals that I think are relevant for media convergence. Thanks for reading, and I'm looking forward to your comments!